Mr. Edward Cope will maintain his responsibility for Discovery and Evaluation. Edward was the former VP for Northern American Exploration for Barrick Gold. Mr. John Budreski will continue as Lead Independent Director and Dr. Roger Steininger co-founder of NuLegacy remains a Director and the Company’s “QP”. 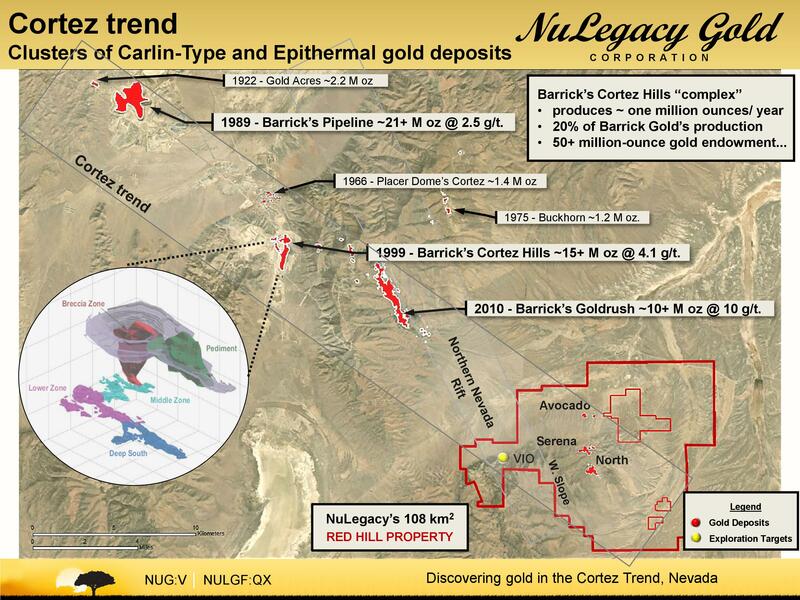 As founding partner, together with Dr. Roger Steininger, Mr. Matter was instrumental in assembling and acquiring the Company’s current 108 sq km Red Hill property in the famed Cortez Trend; the second largest gold trend in Nevada after the Carlin Trend located parallel and 40 miles to the north-east, for which these behemoth Carlin-style gold deposits are named. Initially enrolled as directors, the above three former Barrick executives are now proactive participants in NuLegacy. These gentlemen helped guide Barrick Gold’s most dramatic growth period in the late 1990’s and early 2000’s through its acquisition of Sutton Resources, Arequipa Resources, Homestake Mining, Lac Minerals and Placer-Dome, as well as the discovery of 50 million ounces of gold, and the building of four of the world’s largest gold mines. In 2017-18, with the help of these former Barrick executives, NuLegacy was able to enroll four of Barrick’s world class geo-technical team (listed below). These individuals, under Ed Cope’s direct supervision, contributed to finding that 50 million ounces of gold in the Carlin and Cortez gold trends of Nevada on behalf of Barrick over the past 15 years. Ed Cope Dir, Discovery VP North American Exploration (NV) 1996-2016 n.a. Together with NuLegacy’s long-standing exploration team members of Dr. Roger Steininger, Garrett Frey, Bryan Kellie, Robert Spring, and JoAnn Newbury this former Barrick Gold geo-technical team is transforming the prospects of our Red Hill property. For further information, please phone 604-639-3640 or contact Albert Matter (CEO) at [email protected] or visit www.nulegacygold.com. This news release contains forward-looking statements, which relate to future events or future performance (including, but not limited to, future management roles and personnel and upcoming exploration plans for the Red Hill Property) and reflect management’s current expectations and assumptions. Such forward-looking statements reflect management’s current beliefs and are based on assumptions made by and information currently available to the Company. Readers are cautioned that these forward-looking statements are neither promises nor guarantees, and are subject to risks and uncertainties that may cause future results to differ materially from those expected including, but not limited to, changes in personnel, actual results of exploration activities, environmental risks, future prices of gold, operating risks, accidents, labor issues, delays in obtaining governmental approvals and permits, availability of financing and other risks in the mining industry. There are no known resources or reserves in the Red Hill Property and the proposed exploration programs are exploratory searches for commercial bodies of ore. In addition, the presence of gold resources on properties adjacent or near the Red Hill Property (including, but not limited to, Barrick’s Goldrush property) is not necessarily indicative of the gold mineralization on the Red Hill Property. All the forward-looking statements made in this news release are qualified by these cautionary statements and those in our continuous disclosure filings available on SEDAR at www.sedar.com. These forward-looking statements are made as of the date hereof and the Company does not assume any obligation to update or revise them to reflect new events or circumstances save as required under applicable securities legislation. The three major Carlin-style gold deposits (on trend or adjacent to NuLegacy’s property) of the more recently discovered Cortez trend (1998 to date) have produced in excess of 30 million ounces of gold with currently estimated remaining endowment of >20 million ounces while the much longer exploited Carlin-trend (1965 to date) has produced > 88 million ounces with an estimated remaining endowment of >30 million ounces.